Hurricane Katia off the east coast of the US could cause stormy weather to hit Scotland on Monday, according to forecasters in Miami. John Cangialosi, at the US National Hurricane Center, told the Reuters news agency that Katia was expected to head out into open sea. He said it would change from a tropical storm to a "classic wintertime storm" by the time it reached Scotland. The Met Office has issued a severe weather warning for most of the UK. The forecasters' amber alert - which has been issued for most of Scotland - advises people to be aware of bad weather. There is the potential for 60-70 mph gusts of wind and 80 mph or more could occur over exposed coasts and hills. The Met Office said: "The remains of Hurricane Katia are expected to come across the UK on Monday bringing a spell of very windy weather. "There remains some uncertainty about its track and intensity, though with increasing indications that Scotland and Northern Ireland are most likely to bear the brunt the warning has been upgraded to amber here. "The public should be aware of the risk of disruption to transport and of the possibility of damage to trees and structures." 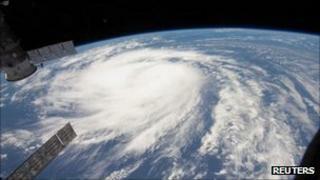 US hurricane specialist John Cangialosi said Katia would change from a tropical system to a larger storm once it was over open sea and would head for Scotland. He said: "It'll likely be a very big, significant weather system. "It will evolve into a classic wintertime storm by the time it gets there."